Looking for a brain workout that will take longer to solve than most basic Sudoku puzzles? 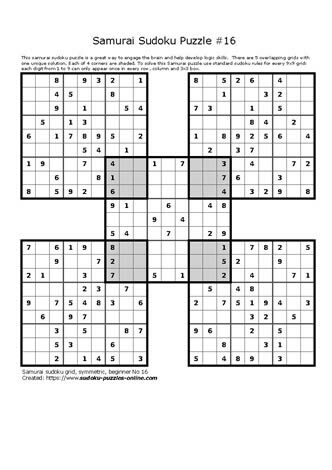 Samurai Sudoku puzzles are the key to providing challenges for puzzle solvers looking to extend their current skills and engage their brains in a fun and unique way. Use basic Sudoku rules plus logical reasoning to solve for the unique solution. 4. Each digit, 1-9, can appear only once in each 3x3 grid within the larger 9x9 Sudoku grid. For this extreme puzzle, there are 41 individual 3x3 grids and 4 shared 3x3 grids (appearing in the corners of the center grid).